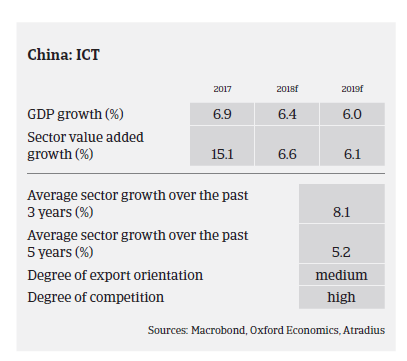 In 2017 Chinese ICT sector production growth outperformed GDP expansion again thanks to technological innovations such as cloud computing, Big Data, Internet of Things, Artificial Intelligence and advanced manufacturing. According to the Ministry of Industry and Information Technology (MIIT), total output of the sector exceeded CNY 18 trillion in 2017 (2016: CNY 16.96 trillion). While the ICT output growth rate was high with 9.1%, it was nevertheless lower than in 2015 (up 10.4%) and in 2016 (up 10.0%). Despite the still high growth rate, the sector faced a challenging economic environment in 2017, which is expected to continue in 2018. Domestic personal computer demand shrank due to higher prices caused by a global component shortage that started in late 2016. Demand for consumer desktops also decreased, while the higher rate of market penetration and lack of major updates/new products has negatively impacted smartphone demand. For ICT manufacturers competition is getting fiercer and major challenges are increasing. Oversupply in some subsectors like panels, printed circuit boards and lithium batteries has triggered price wars. At the same time, surging labour costs weaken China’s cost advantage, especially against competitors in Southeast Asia. In April 2018 the US government imposed a ban for US companies to sell components to the Chinese mobile phone and telecommunications equipment producer ZTE (Washington accused ZTE to have violated US sanctions by illegally shipping American technology to Iran and North Korea) US companies provide a major share of the components used in ZTE’s equipment, and as a consequence ZTE has suspended operations for the time being. Additionally, the US administration has considered to impose 25% punitive tariffs on Chinese telecom items and smartphone components, including displays and circuit boards, which would severely affect revenue growth of telecoms equipment makers. That said, end of May US president Trump announced that his government would lift the ban on ZTE if the company accepts certain stipulations, while talks to resolve general trade issues between the US and China are underway. 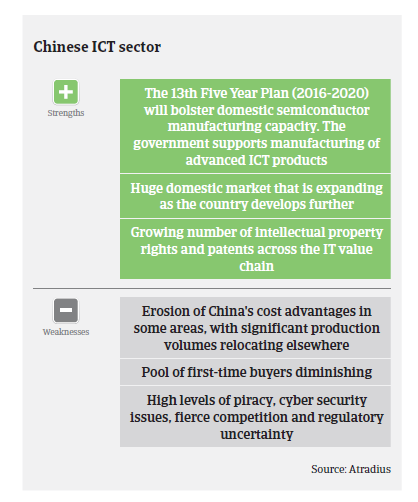 While the imposition of US import tariffs could lead to a slowdown of China´s ICT industry in the short-term, the long-term impact should be mitigated by the fact that Chinese ICT manufacturers increasingly focus on emerging technologies such as Artificial Intelligence (AI), 5G, and the Internet of Things for revenue growth, at the expense of traditional telecoms equipment to drive revenue. ICT distributors and retailers also face major challenges and risks. Most smaller players in this segment are ICT distributors with one or two brands only, and as the ICT market is a fast changing one, such companies are exposed to elevated risks due to highly concentrated product portfolios. Another risk is higher moral hazard during a market downturn, as some players may bet on one-off deals to make big money and disappear from the sector afterwards. Transparency issues remain one of the main challenges in the Chinese ICT sector, as ownership of businesses and group structure are not always evident and there are often different sets of financials. Cross guarantees are widely used in bank lending to ICT traders, meaning that one company’s liquidity collapse could drag down others. On average, payments in the ICT industry take between 30 and 60 days. Due to the more difficult market conditions payment delays are expected to increase in 2018. 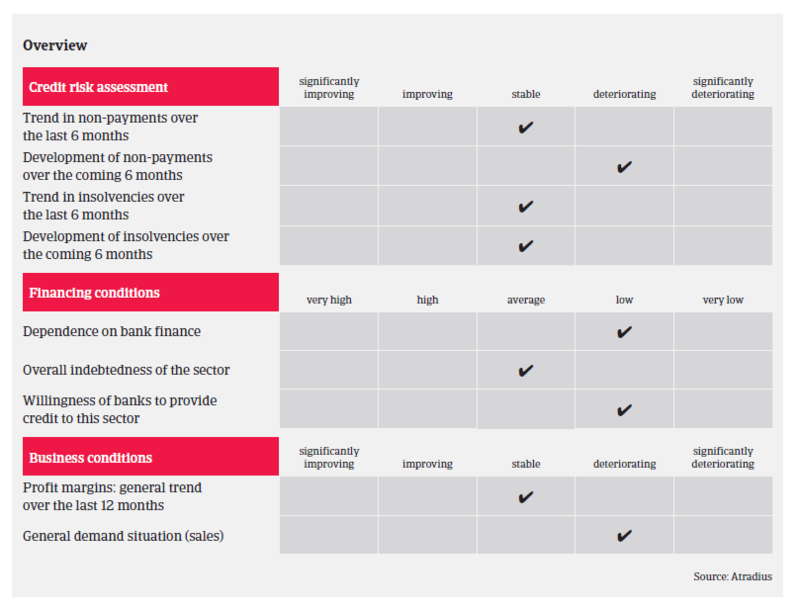 However, a major increase in insolvencies is not expected for the time being. Our underwriting stance remains generally open, but we closely monitor the developments of the trade dispute with US and the US ban on ZTE and potentially on other companies. We especially scrutinise small-sized ICT distributors, system integrators and online retailers, as in those segments competition is fierce and the financial situation of businesses is often weaker.